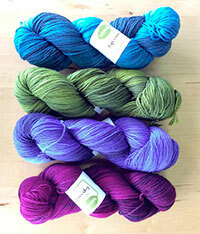 Welcome to The Yarn Barn, LLC's Online Store! Get a Gift Certificate for your Favorite Fiber Artist! Pictured below, Skinny Singles in color Anemone. This special limited edition colorway is used in the Anemone summer top in Interpretations Magazine Volume #5 . Tiny flowers magically appear as you knit! Make a poncho in Baby Blossom Chunky. The pattren is written for a wide range of sizes from birth to 7 years. 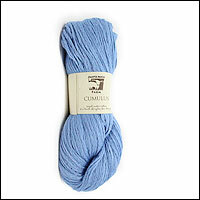 Soft as a cloud and light as a feather, Juniper Moon's Cumulus is perfect for all of your warm weather needs. See more from Juniper Moon! 100% Merino Wool in a beautiful range of colors. Forget Not from The Alpaca Yarn Company is a complete kit with instructions and enough dyed wool, alpaca,and nylon fiber to create a durable yet soft fingerless mitt. 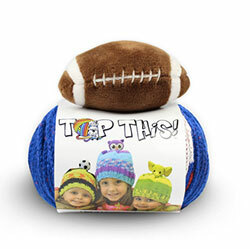 New from DMC, the Top This Hat Kit comes complete with instructions, yarn and topper. 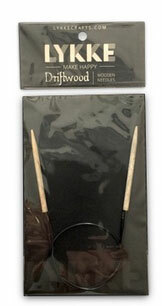 Lykke Driftwood needles, made of beautiful ash wood, will astound you with their beautiful driftwood finish, excellent joins on circulars and smooth knitting!